Meraas, the people behind developments including La Mer, The Beach JBR and Boxpark, have just unveiled a new destination that’s definitely worth checking out, called The Yard. The 350,000 square-foot extension adds to the existing Last Exit D89 in the up-and-coming Al Khawaneej area on the outskirts of the city, near Mushrif Park. As well as the typical extension of new restaurants, shops and landscaped areas, The Yard is also home to Dubai’s first ‘Promise Bridge’. Also known as a love locks bridge, it’s an ode to the original Ponts des Arts bridge in Paris where people can make symbolic pledges to their loved ones by attaching padlocks to the bridge, usually with their initials on them. Inspired by Dubai’s agricultural heartland, The Yard is also home to a rustic courtyard, a farmer’s market, a bakery, a lake and shaded walking trails. 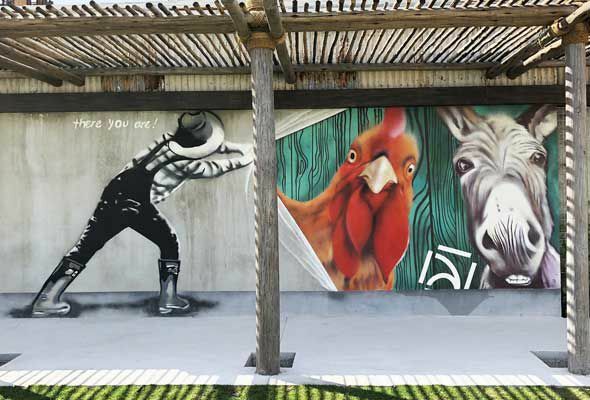 Blending a rural farm environment with urban accents, The Yard also features playful murals, similar to the vibrant artwork displayed across buildings at La Mer. An 18-metre-high windmill, a water mill, a wishing well, decorative vintage pick-up trucks, farm animals and bird houses further scream ‘Instagram me’. When complete, The Yard will be a 2.8 million square-foot urban destination.